For many years, CMS has used either a "crosswalk" or "gapfill" process to assign prices for new laboratory tests. This process is still used for new laboratory tests, up until the time the next triennial PAMA pricing exercise occurs. 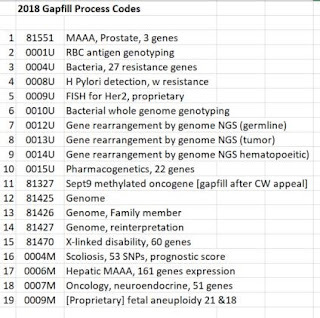 Right now, in spring 2018, about 19 codes are in the active gapfill process. Around April/May, CMS will post MAC proposed gapfill prices and trigger a 60 day comment period. (Sounds like you could base an office lottery on the CMS date). Final MAC gapfill prices will be posted in September. For the first time, MACs will be required to display a "rationale" for their gapfill decisions. Also for the first time, MolDX will have a majority of price proposals, thus controlling the "median" MAC proposed price. 2015: About 30 codes being gapfilled; least half got no price. 2016: About 16 codes being gapfilled, mostly MAAAs; all were priced. 2017: No gapfill activity this year. 2018: About 19 codes being gapfilled. First year requiring "rationales." 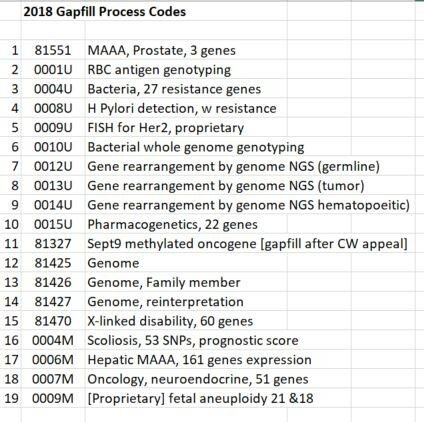 The gapfill process was formalized in regulation by CMS in 2007 due to a Congressional request (the 2003 Medicare Modernization Act, Section 942; see 42 CFR 414.508). PAMA also puts gapfill rules in regulation, although in a somewhat patchy way. PAMA (c)(2) describes the information that gapfill should concern, but as far as I can see, PAMA doesn't give CMS any stated way of handling the gapfill information (e.g. calculating medians of MACs). Regulation at 414.508 says CMS will set prices at "the median of contractor specific amounts." In recent years, rather than setting payment at the median of "contractor" amounts, CMS set gapfill prices at the median of the 57 CLFS zones. Now, in 2018, CMS has no more CLFS zones, so presumably CMS will set gapfill prices at the "median of contractors" rather than the median of states or zones. MOLDX controls 7 MAC jurisdictions (Noridian x 2, WPS x 2, CGS x 1, Palmetto x2) and there are only 5 other MAC jurisdictions (Novitas x 2, NGS x 2, FCSO), so MOLDX will control the median. In final PAMA rulemaking of June 23, 2016, CMS stated that it would require MACs to provide a "rationale" for gapfill decisions (p. 41086). There were no codes being gapfilled in CY2017, but presumably now in CY2018 MACs will be required to provide a "rationale" for their gapfill decisions. The "rationales" for CMS crosswalk prices can be pretty scanty, so don't expect too much from this new requirement for gapfill rationales. 2018: Crosswalk to "an" appropriate code or "the" most appropriate code? Whereas regulation 414.508 specifies that crosswalk is to "an appropriate test," statute 1834A(c)(1) requires that CMS crosswalk to "the most appropriate test." Arguably the statute sets a higher bar for what is an acceptable crosswalk than the regulation. Often, two or three crosswalks are being debated and have different pro's and con's, and CMS could easily say it had chosen "an" appropriate code among its choices, which was all it had to do. Proving you have chosen "an" appropriate code rather than "the" most appropriate code....key policy point, or angels dancing on the head of a pin? The PAMA legislation of 2014 created a new category of test, Advanced Diagnostic Laboratory Tests, with special initial and annual payment rules. Test must be sole source tests, either of the MAAA type (Type A) or the FDA-approved sole-source type (Type B) (42 CFR 414.502). Somewhat belatedly, on March 23, 2018, CMS released application forms, quarterly calendars, and additional guidance for becoming a MAAA. Find the CMS webpage HERE. CMS is planning to enforce a rule (not found in the PAMA law) that the test must provide "new clinical diagnostic information not available from any other test or combination of tests." The applicant writes this justification itself, and it's not obvious how CMS staff would search the market for tests not named by the applicant (this might take a lot of content knowledge about the industry, available tests, and clinical care pathways), but they will use the Advisory Panel on Clinical Diagnostic Laboratory Tests to assist them (guidance document, page 8). They don't mention an appeal process yet. The "originality clause." I never thought this whole "originality clause business" was applicable, since it's not in statute, and even more, the statute explicitly contemplates ADLTs that are 510(k) tests, thus, have a close predicate and often the same intended use. It's unclear exactly how CMS will apply these originality concepts (e.g. for competing breast or prostate cancer MAAAs) or if a test would cease to be an ADLT in the future if a too-close competitor appeared. CMS seems to box itself off unnecessarily from value-based purchasing. For example, if a test replicates a prior ADLT MAAA, but is performed twice as fast at half the cost, it might not be able to be an ADLT because it didn't have a "unique" clinical purpose. Would the FMI F1 test be "original" enough? Both the FDA approval and the CMS coverage focuses laserlike on its CDx tests, but exactly those F1 CDx tests are generally available from "one or more other tests on the market." OK, this is a trick question, because this is a PMA/510k category ADLT ("criterion B ADLT"). Some tests may be both a Criterion A ADLT (it's a unique MAAA) and a Criterion B ADLT (it's a sole source MAAA that is FDA approved). It may be better to apply for ADLT for this test as a "Type B ADLT" because it avoids any review under the originality clause. If you upgrade your test (from a 50 gene to a 51 gene MAAA) to your reboot the ADLT periods by becoming a "new" MAAA ADLT? If you're an LDT, how do you define and revise your "claim?" Isn't partly it up to you? The FDA and CLIA aren't writing your "Claim" for you like the FDA does for reviewed products with formal FDA labeling. The "Licensing clause?" What Licensing clause? In final PAMA rulemaking, June 23, 2016, CMS said that a university that licensed-out IP for a test could not be the test developer, but also, that a lab that licensed-in IP for the test could not have been the sole developer, either, and neither could be an allowable "successor laboratory." Since almost all tests license some IP from somewhere, this seemed tortuous. See and read: 81 FR 41060, column 1, June 23, 2016. Gratefully, CMS has chosen to simple drop any explicit reference to this perplexing part of the original rulemaking. However the paperwork does refer to "the lab that DESIGNS" the test in a few places, not just the lab that solely provides the test. CMS will process applications quickly, e.g. accepted during January, reviewed during February, applicant notified during March, and code and payment active April 1. Tests must show they have been "covered by Medicare Part B." This is probably a good thing, because it means early policy benefits won't expire while the newly launched test is just awaiting coverage. Once tests have coverage, they can apply for ADLT. ADLT law gives them "market list price" payment for 9 months, then payment at an annually surveyed market median price. (This latter survey median price is similar to the triennial survey price for regular lab tests). Often lab tests (like other health services) have list prices that float substantially above actual prices, e.g. $4000 list, but real world discounted $2200 average price from payers. If the gap between the initial "list" payments and the later "average" payment is large (130%), CMS can recoup the difference. It's not hard for CMS to do this, it's common; MAC just sets up a debit against future payments. Labs would be incented (in their first nine months) to accept high payments but appeal low payments to ensure only high payments are logged for CMS price setting review. This pushes the lower priced claims like a bolus into the next fiscal period, but the first fiscal period is weighted most heavily due to the clawback rule. Want to see in real numbers? I show an example where a lab gets $21M instead of $13M (net of clawbacks) in years 1 and 2 together, here. See also Medlearn Article SE1619, 2017, which provides general guidance on CLFS PAMA reporting. Update: There was also a detailed article on the topic in Boston STAT on March 13 here. It's likely a firewall article, but NYT runs a detailed article on the growth of the field of FDA-approved digital therapeutics. For example, one featured app is the ReSET app, prescription-only, which was authorized by the FDA last fall as the first app for improving outcomes in addiction treatment programs when used in conjunction with or added to outpatient standard of care. The article discusses pro's, con's, and policy issues from a range of perspectives. The President's Cancer Panel serves NCI and was created by the National Cancer Act of 1971. * New news: The panel has now issued a report on "Promoting Value, Affordability, and Innovation in Cancer Drug Treatment." The 70-page report is online here. Trade press at BioPharmaDive here. In other news today, Right to Try legislation failed to reach a 2/3 majority vote in the House, falling 7 votes short. Right to Try is "access to experimental options for life threatening illnesses when patients have run out of options." It was supported by most Republicans and by the President per his State of the Union speech. US regulators were generally not in favor, pointing out there are already "compassionate use" frameworks that are similar to the right-to-try concept, but follow trackable channels. In October 2017, FDA commissioner Gottlieb "raised concerns" about the bill, as did Deputy Commissioner Rachel Sherman and CBER director Peter Marks. I've borrowed from a trade article here. Such an approach is just one example of how the FDA is taking an original policy approach to the regulation of a highly innovative field, one in which our traditional approach to regulation may not be as efficient or effective as in more mature fields. As part of its efforts in the area of regenerative medicine, the FDA is also encouraging investigators who are involved in innovative product development to engage in dialogue with the agency early on in the process, including through informational meetings, before more formal discussions are held about submitting an application for an investigational new drug.... Our aim is to refashion our traditional tools for regulation to meet the challenges and opportunities presented by such highly innovative products as cell-based regenerative medicine. Richard Rettig's 1977 book on the National Cancer Act of 1971: "Cancer Crusade," Princeton. Legislative history was a carnival and the history traced back a decade. According to a Form 8-K filed on Monday by the company with the US Securities and Exchange Commission, the OIG subpoenaed Myriad for documents related to its billing of government-funded healthcare programs for its hereditary cancer tests. The subpoena covers a period starting Jan. 1, 2014, through the date when the subpoena was issued. Myriad launched its 25-gene myRisk Hereditary Cancer test in September 2013. Myriad said in the SEC document that it is cooperating with the government’s request and responding to the subpoena. At this time, no claims have been made against Myriad. Myriad payments from Medicare are open public record, but Medicaid payments are not. CY2014 CMS payments are here, CY2015 CMS payments are here. CY2016 CMS payments have been released by state; they will be released about May/June 2018 by lab or doctor. Cloud spreadsheets here 2014 and here 2015. I've previously noted (October 2017) that there seems to be a 2015-2017 edit blocking use of 81211-81213 together unless a special medical circumstance dictates that use of a -59 modifier is appropriate. CMS reiterated the same 81211/81213 edit in December 2017 for CY2018, here. As a retired former medical director, and consultant giving advice to other labs about how CCI edits work and are enforced, I was puzzled how Noridian was handling the intersection of the 81211/81213 payments in light of the CCI edit; see Noridian's response here. CMS guidance on when - and when not - to use Modifier 59, here. Article by OIG authors on Modifier 59, here. In a commentary at a Cowen and Company conference, early on March 13, 2018, [audio archived in cloud], CEO Mark Capone briefly commented on the subpoena, noting that Medicare was only 7% of Myriad revenue and that doctors typically currently order Integrated BRACAnalysis and MyRisk, the former of which is processed in a Sanger laboratory and with a large DupDel platform BART, and the latter in a separate NGS laboratory. MyRisk was undergoing MAC contractor review and finds substantial mutations not found in BRCA analysis alone. Currently billing is via 81162. Details of a February 9-10 AMA CPT meeting are confidential to participants and observers of the meeting. However, AMA posts a brief public notice of the results on its website. Revisions to the BRCA code set were determined and would normally appear in the 2019 code book. In its public notice, AMA refers to "deletion of 81211, 81213, 81214." In morning trading on March 13, 2018, MYGN was down about 10%, from about $33 to about $29. Recent peaks include $43 on October 1, 2015 and $37 on January 1, 2018; recent troughs include $16 on January 1, 2016. 2014-2015-2016 BRCA Payments by CMS: Data Tables. Tables of 2014-2015-2016 BRCA payments by state and lab here, with links to all data sources. On February 15/16, there was a flurry of initial press about Roche's $1.9B acquisition of Flatiron (of which it already owned 12%). On February 26, Reenita Das, an SVP at Frost & Sullivan, provided a deeper-dive strategic review in Forbes - online and open access here. Flatiron provides EHR services to oncology clinics, but "regulatory barriers prohibit a pharma from directly collaborating with a provider." Like any business or service, Flatiron has to create value - it sells something for $500 that creates $1000 of value for the buyer - yet not underprice or "create too much value" that might seem like a giveaway from one healthcare entity to another, especially where one is an ordering provider. By speeding patient identification Flatiron "can help save developers millions of dollars." Roche, with a market cap of about $200B, had $55B in 2017 sales, $40B in gross profit (above cost of goods), and $8B in net profit. It's 60% oncology - think Genentech drugs like Avastin and Herceptin - much of its oncology franchise is burning through its patent life. Flatiron is potentially a world pioneer in large scale real-world evidence. Chief Medical Officer Amy Abernethy MD has written a range of articles on RWE in the last couple years; see PubMed. Flatiron, Foundation Medicine, and Roche Oncology form a trio. Roche also has agreements with digital genomics and machine-learning company GNS Oncology "to analytize proprietary EHR and next generation sequencing data for insights on drivers of drug response and cancer progression....Roche has one of the strongest portfolios of database and analytics platforms at its disposal to support its personalized drug discovery program in oncology." GNS raised $6M last summer from Amgen and others. Other biopharmas may look for NGS or EHR tie-ins to remain competitive against the Roche-Flatiron-FMI triad. On February 22, 2018, COTA (a "healthcare real world evidence and data analytics company" raised $40M in Series C funding from IQVIA, EW Healthcare, MSKCC, Horizon BCBS, and others. For an earlier article on Flatiron at the time of its 2016 $175M round, here. Aetna oncologist/medical director Michael Kolodziev joined Flatiron in July 2016 and transitioned to consultancy ADVI in October 2017. Investors in GNS include: Amgen, Celgene, Zambon Pharma, Regence BCBS, Horizon BCBS, Mitsui, GHO Capital, Fort Rock Capital. Investors in COTA include: IQVIA (publicly held holding company), EW Healthcare Partners, MSKCC, Boston Millenia Partners, Horizon BCBS, Hackensack Meridian Health, ATOC Holdings. Prior investors in Flatiron included founding investor Google Ventures, Roche, Allen & Company, Baillie Gifford, Casdin Capital.